In the early morning of this past memorial day [la kau pua], Prince David Kawananakoa and his friends glided quietly up to the grave of our Alii. As he entered, he placed flowers and beautiful lei upon the coffins there. It is good that he honored them, and we believe this to be aloha for the alii. We are with him in his actions. Ka Nupepa Kuokoa, Buke XL, Helu 23, Aoao 2. Iune 6, 1902. Beginnings of Royal Mausoleum at Mauna Ala, 1865. Royal Mausoleum.—We have heard that an agreement has been reached between the Minister of the Interior and T. C. Heuck, Esq., to commence once again, during these days, the work on the Royal Mausoleum at Mauna Ala in Nuuanu. The stones are ready, and everything is prepared for the building to be built, and hereafter all the native born will be pleased to see this grand memorial building where the parents of the populace who have left the light of the world lay to rest. Ke Au Okoa, Buke I, Helu 1, Aoao 2. Aperila 24, 1865. E o, e Ka Wahine Hele La o Kaiona! 1913. Once again, the day of the Benevolent Alii, Mrs. Bernice Pauahi Bishop, was commemorated on this past Friday, by the students of the Kamehameha Schools, and this makes the twenty-sixth year that it has been remembered at her grave at Maemae; there was placing of flowers, singing, and short speeches made there that day, and being that it was a nice day, everything went smoothly until finish. At almost ten o’clock that morning, the boy students of Kamehameha and the girl students of Kamehameha arrived at Maemae, and as they disembarked from the cars, they stood in lines with the girls taking the lead, followed by the little boys and the big boys at the end. Right before the grave of Alii Wahine Pauahi, all the students stood in line, and George Andrus lead them in the song, “He Inoa no Pauahi.” It was Queen Liliuokalani who composed this himeni; and after this song, the decorating of the grave began with all varieties of flowers; the grave was so beautiful to see. 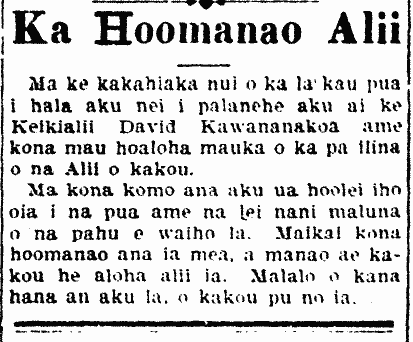 Following the placing of flowers, the students then sang a song, “Pauahi ke Alii,” and then the all the boys joined together to sing “Pauahi o Kalani.” After this song was finished, each school read memorized passages from the Bible, then after the singing of a haole mele, “Only Remembered,” the girls carried out their last remembrances, and that was the end of the prepared program, and then the hymn, “E Pili i Ou la Wau,” was sung by the Royal Hawaiian Band, and the students of the military program marched to the street where the special street cars stood waiting to take them back to the schools. That was the close of the commemoration of the day of the Chiefess Pauahi. 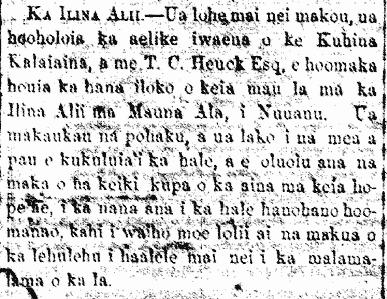 Ka Nupepa Kuokoa, Buke LI, Helu 52, Aoao 1, Dekemaba 26, 1913.